It's been awhile since I have done a posting - been really busy just going about every day life, and have not been spending as much time doing cards lately. I think I am also really tired and when I get home from work and have put my son to bed, I look longingly over at my craft bench then stumble off to bed exhausted! So what else is there to inspire me more but another SPCC week!!!! And let me just say that I really struggled with these colours. 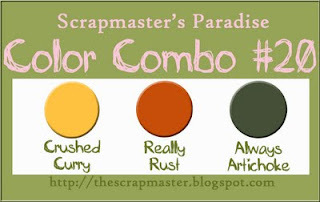 I usually go for the pinks, greens and purples, even like using brown. But these rust and yellowy orange shades really had me struggling. Our fabulous sponsor this week is DRS Designs. DRS are a family owned company and have a fabulous range of high quality, wood mounted rubber stamps as well as unmounted rubber depending on your preference. DRS is offering a $15 gift certificate for this week's winner! Here is my card - I wanted a birthday card for a male friend. 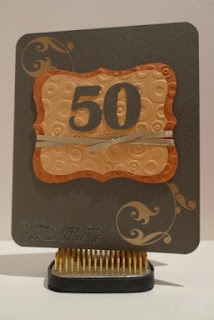 Used my Making Memories Slice - Noteworthy card, and also my Cuttlebug to emboss the circles. The rub on sentiment is from Kaisercraft. Great job Diva! Love the embossing. Lovely card. Thanks for sharing! Big giveaway over at my blog! Excellent job Diva!! You used the colors great! Great job working out of your comfort zone!!! This a fantastic card and great colors for a male card! Love it! So much texture!